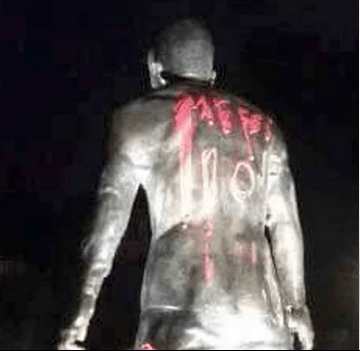 Messi fans vandalise Cristiano statue after 2016 Ballon D’Or ceremony on Monday – The 30-year-old who lost out on 2015 Ballon D’Or title with 27.76% of the vote and Messi 41.33%, wouldn’t have hurt enough, a statue of Cristiano Ronaldo was violated on Monday. “It’s a shameful act committed out of jealousy towards him, The rage that some unloved and frustrated fatheads display in public in a disgraceful way which leaves me as a Portuguese person ashamed and sad. The statue has been since been restored by officials. See the damage done below!